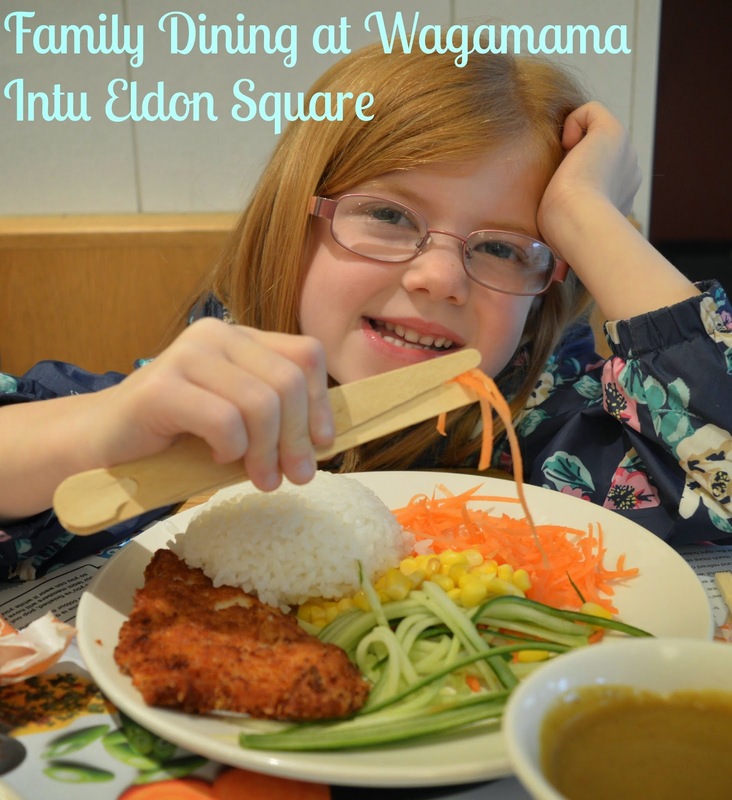 During a recent after school shopping trip to intu Eldon Square we decided to try something different and booked a table at Wagamama. Described as being based around Japanese Ramen bars it has to say my mum was a little reluctant. A quick look at the menu and she was reassured that I wasn't taking her to eat raw food (which is a big no-no for her) and we were all looking forward to our visit. Wagamama in Newcastle is extremely well located should you need to take a break from shopping. It can be accessed via steps beside carphone warehouse from inside Eldon Square or from the green outside of old Eldon Square (click here for a map). The restaurant is light and airy with an open kitchen and bench style seating. Food is all cooked to order and brought to your table as it is ready. Service is super quick and the staff are friendly and know their stuff. The staff were wonderful with our children and we were made to feel more than welcome. It is recommended that you order your children's meals straight away so they can be at your table in the quickest time. This is an excellent idea and more restaurants should take note! The children ordered some freshly squeezed apple juice and were presented with a mask making kit to keep them entertained. Harry (aged 8) has turned particularly picky in these last few months and was not impressed when he discovered his usual order of chicken nuggets and chips was not on the menu. I quickly reminded him about the importance of healthy eating and he agreed to try a mini chicken ramen which is a chicken soup topped with grilled chicken breast, carrot, sweetcorn and greens. We were very happy with his choice and for £4.85 it was a huge portion - very filling and nutritious and for once I didn't feel guilty about eating out knowing he was actually eating something healthy! Despite his earlier grumbles Harry enjoyed it too and even asked if we could re-create the dish at home. Our younger two decided to order mini chicken katsu (£4.65) which is chicken breast deep-fried in panko breadcrumbs, served with sticky white rice, carrot, cucumber and sweetcorn. This dish is served with a choice of either katsu curry or amai sauce on the side (we went for both and were told we could swap at any time if the children wanted to try another sauce). Although they left the sauce, the chicken, rice and vegetables went down a treat - I also liked the little touch of everything already being cut up and ready to eat in bite sized pieces for them which save me a job! Our children were given their own easy to use chopsticks or there were knives and forks available if needed. The novelty of using chopsticks is too much to resist though and they all gave it a good go. There are so many things I liked about the children's menu and it is clear that a lot of thought has gone into it's design - food is healthy and not 'mixed together' so there is no playing around with food, picking out parts they don't like. I also appreciate sauce being served on the side as standard which is a huge plus point when dining with fussy eaters. Throughout our meal the staff checked everything was ok and helped our children with their masks allowing the grown ups to eat their food which was really appreciated. Regular readers of our blog will know that calamari is our favourite starter. Wagamama's version did not disappoint - it has a light hint of chilli and was served with a fresh chilli and coriander dipping sauce. I ordered the prawn kare lomen (£11.50) which are ramen noodles in a spicy coconut and lemongrass soup topped with grilled prawns, cucumber and beansprouts. The dish had a definite thai flavour to it and my portion was absolutely huge. I could only manage about half of it. Our dishes were cooked freshly to order and you could really taste the freshness. There were plenty of juicy prawns in my ramen too making this dish excellent value for money. My mum went for the firecracker chicken (£9.95) and was warned that this dish is very spicy. She assured our server she could handle it though (and indeed she did). Described as marinated chicken breast stir fried with mangetout, red hot chillies, red and green peppers, spring and white onions, fiery sweet and hot sauce, steamed white rice, shichimi, sesame seeds and lime this dish certainly was one of the spiciest I have tried. It was beautiful though and I am going to order the prawn version on my next visit. Our children ended their meal with a real fruit ice lolly to take away which is the perfect solution if you are in a hurry to leave but still want to treat your children. If you are looking for a healthier alternative to fast-food, definitely give Wagamama in intu Eldon Square a try. Our table of five were in and out in less than 40 minutes. The food was fresh, delicious. plentiful and nutritious and the staff could not have been more welcoming to our children. Have you been to Wagamama? Which dish would you recommend? You can find Wagamama on Facebook here. I LOVE Wagamamas and haven't been for ages, it's been so long that I haven't even been to the one in Newcastle ... shocking! Did you not try any dessert? The chocolate cake with wasabi is amazing - I always have to leave room for it! I also always insist on eating with chopsticks even though I'm useless with them and tend to end up flinging my food round! I live two minutes from the Metro Centre and pretty much eat at Wagamama at least twice a week. I absolutely love it! I usually get chicken raisukaree (my absolute fave), yaki udon (perfect for a hangover for some reason) or teriyaki salmon soba. So so good!! Chicken Kare Lomen is my absolute favourite I even learned how to make it at home I love it so much! Ebi Kare Lomen is probably my favourite Wagamama dish! Seriously yum! If the kids want to recreate the dishes at home, I can really recommend 'The Wagamama Cookbook'- The food in it is really delicious and recreates what you get in the restaurant really well.